Want to quickly identify where the fishes are clustered or gathered? Watch the birds in and around the area. Wherever you find lots of birds around the pier, chances are that you’ll find more fishes there too. Please note that the waters might be unclear during the high tide, thus necessitating a bit of trial and error fishing. If you also need to know the best spots for your pier fishing, try asking fellow anglers. On the other hand, you should try nearby pilings with weeds and bulkheads or seawall locations. Pier fishing can be a wet activity. You should, therefore, have a way to protect your phones, wallet and other essentials. These bags are designed to completely prevent moisture and are virtually impermeable to water. So, if you have your things on there and the bag happens to fall into the water, you can rest assured that all your valuables will be intact and uncompromised by the water. 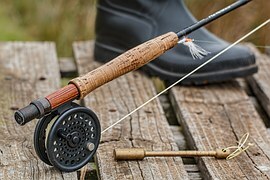 Thankfully, there’s an active community of pier fishing enthusiasts online, thus making it easy to find where the fish are in different states and localities. So, search the forums for where particular species are abundant. You should also ask pier officials and shops selling tackle and baits. In fact, they can often tell you how far inland the fish are and what bait is best for catching them. This is particularly important advice for beginner anglers. Most beginners tend to rush to the end of the pier and then cast their lines as far as possible. Seasoned anglers, however, tend to survey the pier and take other factors into consideration before settling on a spot from where they cast their lines. Some of these factors include the color of the water –fish tend to hang out where the cloudy water meets clear water-, pilings potentially housing food and bait for the fish, and tide. So, if you know any expert anglers, watch where they go to cast their lines. Chances are they are right on the money. The good news about pier fishing is that many experienced anglers are often willing to offer advice and encouragement if you ask nicely. Better still, watch how they cast their lines, see where and how they stand, look out for their specific baits –natural or artificial, bait for bottom feeding fish or shallow swimming fish-, and then try to use the same bait and tackle; particularly if you are looking to catch the same fish species that they intend to catch with their baits. Pier fishing sometimes happens in places where other people –usually people uninterested in angling- go to have fun and hang out. This means that you have to be watchful of your immediate environment. So, be careful about your casting styles. As much as possible, avoid using power casting moves in close quarters. And get your things properly arranged so it doesn’t get in other people’s way. Finally, be considerate. Pier fishing is often done on a first come, first served basis. So, even if your friends aren’t around yet, don’t reserve spots for them. Let others use whatever spot they find. It’s common courtesy. Oscar King is a freelance writer and fisher who enjoys all types of fishing. He loves to share with is audience his fisighing trips and tips.